I use task manager a LOT in my job. I also almost always have a ton of programs running, therefore, do not have much space on my taskbar and get tired of finding “just the right spot” to right click in on to get to Task Manager. 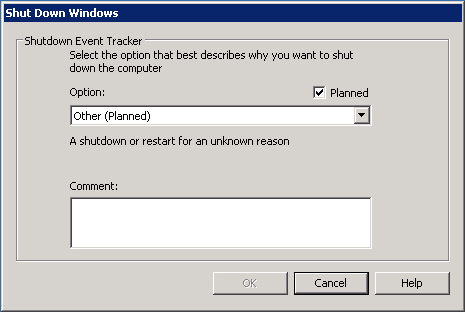 As you know, with Windows 8/Server 2012, this becomes even more of an issue (don’t get me started). Note: You could easily replace this with any other program you frequently run as well J. Since starting with my new company, I will begin by saying I am first going to migrate off some of my older blogs from here while I am still able to. I do not plan to migrate every post, but only ones which are still relevant, so I welcome your patience. As always, I’m happy to write about anything else that you are hungry for hearing as well. 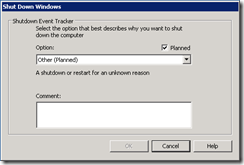 First things first, I frequently do a lot of testing inside Virtual Machines (VMs) using Windows Server operating systems and one thing I’ve grown to dislike is having to type in a reason as to why I decided to shut down or restart my machine. Note: You will need to typically create the “Reliability” registry key before adding the registry value… or you can just cut and paste the above into notepad and save it as a .REG file for immediate import. No rebooting is required for this and I’ve confirmed it works on Server 2003, 2008, and 2012.